Division. Disobedience. Legalism. These are just a few of the many problems that plague churches today, just as they plagued the Corinthian church in the first century. That's why, out of his great love and concern for this young church, Paul addressed these issues boldly, offering the Christians at Corinth much-needed admonition, instruction, and encouragement. If you have ever witnessed a church split or a denominational dispute, you know firsthand that the same sort of struggles impact our churches today. In Twelve Challenges Churches Face , pastor Mark Dever-a leading authority on the subject of church health-tackles this and eleven other major challenges we must fight to overcome. 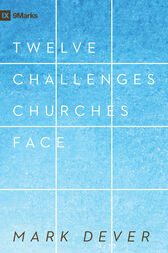 These twelve challenges, if left unchecked, can cripple a church and stifle its ministry to a needy world. But if individuals and churches immerse themselves in God's Word and heed Paul's instruction, God will heal even the sickest church and transform it into a powerful vehicle for proclaiming the gospel of Christ.